Procedures for accessing the nearest airport information vary by the type of display installed in an aircraft. 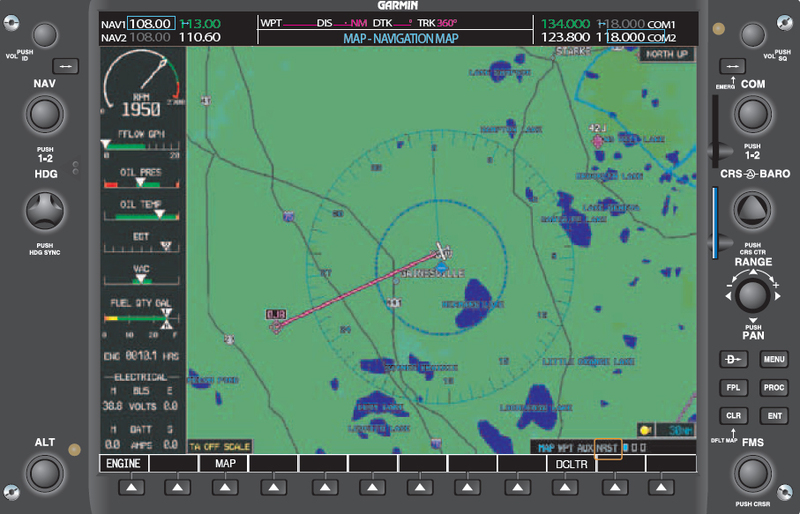 Pilots can obtain information relative to the nearest airport by using the PFD, multi-function display (MFD), or the nearest function on the GPS receiver. The following examples are based on a popular system. Pilots should become familiar with the operational characteristics of the equipment to be used. With the advancements in electronic databases, diverting to alternate airports has become easier. 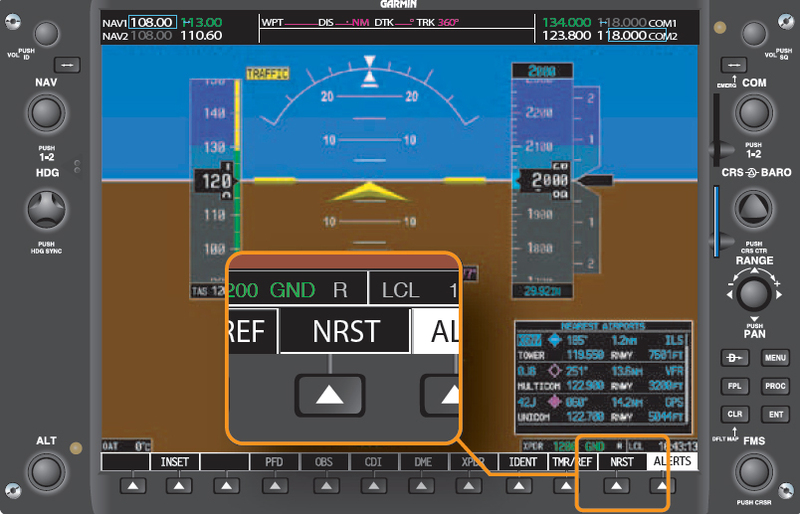 Simply by pressing a soft key on the PFD, pilots can access information for up to 25 of the nearest airports that meet the criteria set in the systems configuration page. [Figure 11-9] Pilots are able to specify what airports are acceptable for their aircraft requirements based on landing surface and length of runway. Figure 11-9. The default soft key menu that is displayed on the PFD contains a “NRST” (Nearest Airport) soft key. Pressing this soft key opens a text box that displays the nearest 25 airports. 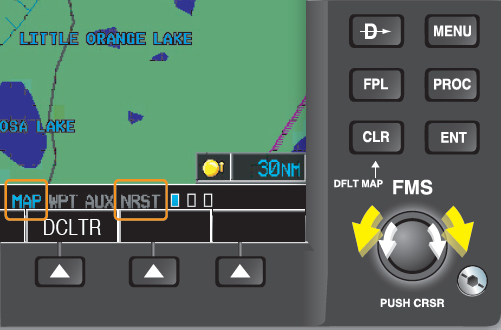 When the text box opens, the flashing cursor is located over the nearest airport that meets the criteria set in the auxiliary setup page as shown in Figure 11-10. 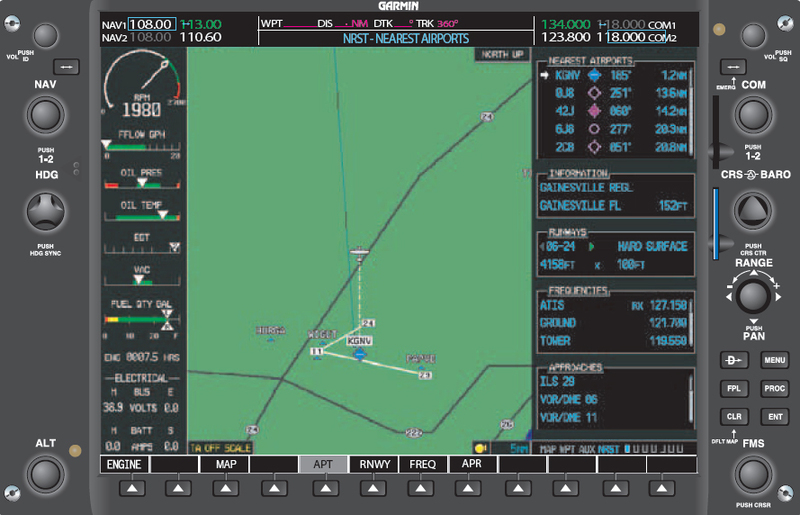 Scrolling through the 25 airports is accomplished by turning the outer FMS knob, which is located on the lower right corner of the display screen. Turning the FMS knob clockwise moves the blinking cursor to the next closest airport. By continuing to turn the knob, the pilot is able to scroll through all 25 nearest airports. Figure 11-10. An enlargement of the box shown in the lower right of Figure 11-9. Note that KGNV would be flashing. 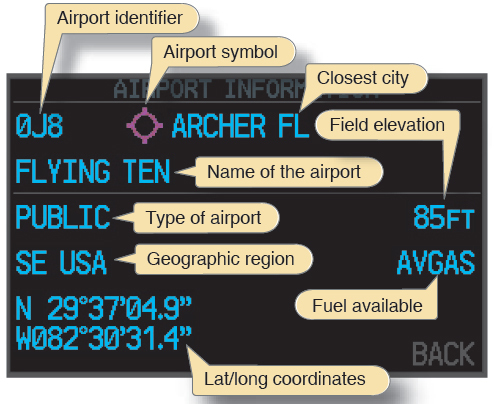 Each airport box contains the information illustrated in Figure 11-11, which the pilot can utilize to determine which airport best suits their individual needs. Figure 11-11. Information shown on the nearest airport page. In addition to the information that is presented on the first screen, the pilot can view additional information as shown in Figure 11-12 by highlighting the airport identifier and then pressing the enter key. Figure 11-12. Information shown on the additional information page that will aid the pilot in making a more informed decision about which airport to choose when diverting. 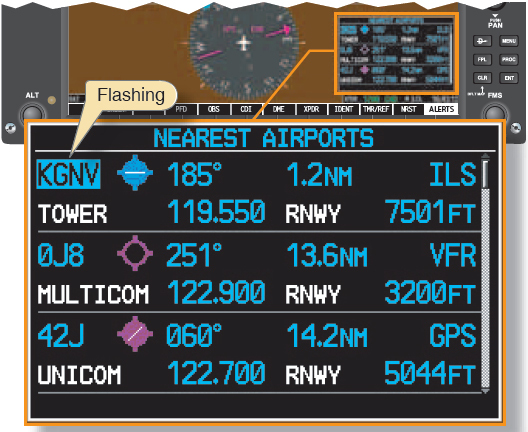 From this menu or the previous default nearest airport screen, the pilot is able to activate the Direct-To function, which provides a direct GPS course to the airport. In addition, the pilot can auto-tune communication frequencies by highlighting the appropriate frequency and then pressing the enter key. The frequency is placed in the stand-by box of either COM1 or COM2, whichever frequency has the cyan box around it. Figure 11-14. Page groups. As the FMS outer knob is rotated, the current page group is indicated by highlighting the specific group indicator. Notice that the MAP page group is highlighted. Within each page group are specific pages that provide additional information pertaining to that specific group. Once the desired page group and page is selected, the MFD remains in that configuration until the page is changed or the CLR button is depressed for more than 2 seconds. Holding the CLR button returns the display to the default moving map page. The nearest airport page contains specific areas of interest for the airport selected. [Figure 11-15] The pilot is furnished information regarding runways, frequencies, and types of approaches available. Figure 11-16 illustrates four specific soft keys that allow the pilot to access independent windows of the airport page. Selection of each of these windows can also be accomplished by utilizing the MENU hard key. The soft keys and functions are as follows: Scroll through each section with the cursor, then press enter to accept the selection. APT. Allows the user access to scroll through the 25 nearest airports. The white arrow indicates which airport is selected. The INFORMATION window is slaved to the white arrow. 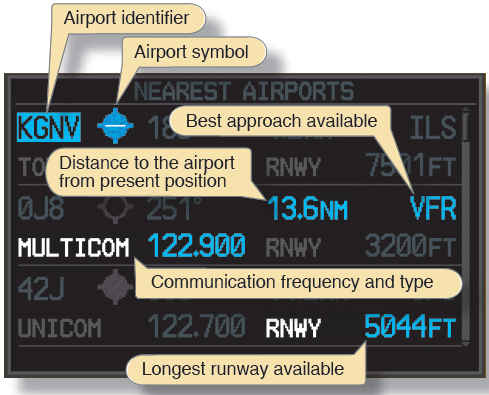 The INFORMATION window decodes the airport identifier. Scroll through the 25 airports by turning the outer FMS knob. RNWY. Moves the cursor into the Runways section and allows the user to scroll through the available runways at a specific airport that is selected in conjunction with the APT soft key. A green arrow indicates additional runways to view. FREQ. 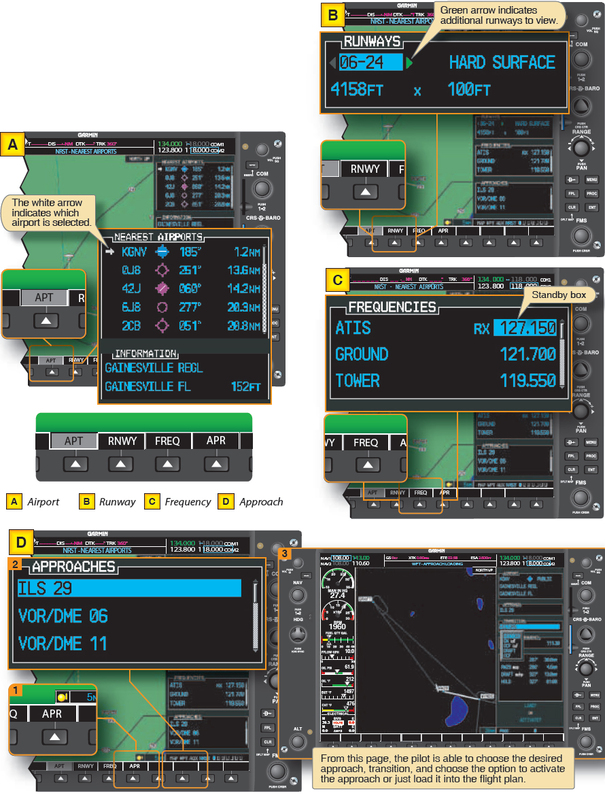 Moves the cursor into the Frequencies section and allows the pilot to highlight and auto-tune the frequency into the selected standby box. APR. Moves the cursor into the Approach section and allows the pilot to review approaches and load them into the flight plan. When the APR soft key is selected, an additional soft key appears. The LD APR (Load Approach) soft key must be pressed once the desired instrument approach procedure has been highlighted. Once the soft key is pressed, the screen changes to the PROC Page Group. From this page, the pilot is able to choose the desired approach, the transition, and choose the option to activate the approach or just load it into the flight plan.